Natural and cultural diversity, on the one hand, and the uniqueness of the formula these two elements blend into, are the main reasons for planning a vacation in Sardinia. Adding the strong historic background and heritage which is, in part, so well preserved throughout Sardinia, one might just as easily say that the island is a top notch tourists destination. The history of Sardinia is the history of a place coveted after by many civilizations. Natural history features the island as one of the oldest land formations in the entire Europe, whereas human history begins in Sardinia only as from the Paleolithic Age. People from both the nowadays Italian mainland and the Iberian peninsula are said to have founded the first settlements on the island. However, Sardinia was rapidly drawn into the historical deeds of the Roman Empire, but Spaniards have also held dominion over it during the Middle Ages and the Modern Era. In 1861, Sardinia became a part of the united Kingdom of Italy, though its statute is of autonomous region. Variety is the best word to describe the accommodation solutions offered by the many cities, towns and villages located on the island. The localities in themselves – among which Cagliari, Sassari, Alghero, Olbia, Porto Torres, Porto Pino and Bosa are the most significant – are extremely heterogeneous with respect to culture and civilization, so the lodging services they offer differ greatly from one to another, reflecting, in fact, the specificity of the respective locality. Agritourism is highly developed in Sardinia; thus, usual hotels, despite their possible high rating, may be ruled out in favor of certain rather picturesque establishments. Richness is the very concept which defines best the cuisine in Sardinia. The Sardinian salami and the Sardinian ham, as well as the boar, the donkey meat, the suckling pig, the sheep and goat meat, and, finally, the ostrich are the most popular meats among the locals in terms of hearty meals. On the other hand, mullets, catfish, lobster, tuna and sea urchins are the main ingredients offered by the generous sea fauna to the local cuisine. While at it, tourists should try bottarga, which is extremely specific to Sardinia. Sardinia is also impressive by its overwhelmingly various offer of cheese, of pasta and rice specialties, and, last, of mushrooms and sweets. Wine is yet another product which brings fame to the island (of which Cannonau and Vernaccia di Oristano are the most notable). 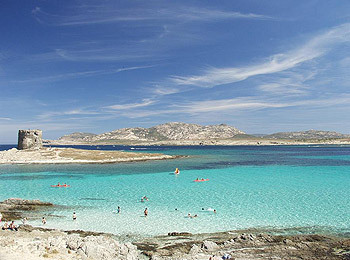 Due to its natural and wild life uniqueness, Sardinia hosts three national parks, namely, the Asinara National Park, the Archipelago of La Maddalena's National Park and the Gennargentu National Park. Also, the island has ten regional parks and sixty wildlife reserves. In terms of museums and galleries, the island hosts more than 70 establishments of this kind, the most notable being the National Museum of Archeology, the Oriental Art Museum, the National Picture Gallery, the Museum of Zoology and Mineralogy (all in Cagliari), the National Science Museum and the Modern Art Museum (in Nuoro). Plenty of museums are to be found in any of the Sardinian provinces, which is more than enough for the tourist picture of the place, by far complemented by the very specific nuraghi, remnants of old times tower fortresses. The Citrus Festival, the Porto Cervo Wine Festival, the Girotonno, the Zeddiani Tomato Fair count as the most significant festivals dedicated to what Sardinia excels in with respect to cuisine and drinks. The Festival of St. Ephysus, the Our Lady of Valverde, the Cavalcata Sarda, the Festarch, the Polo Gold Cup and the White Night represent further manifestations which are worth attending to, just as Narcao Blues, the Medieval Historic Show, the Time in Jazz, the On the Border between Sardinia and Jazz Festival are.